The 72 lb. 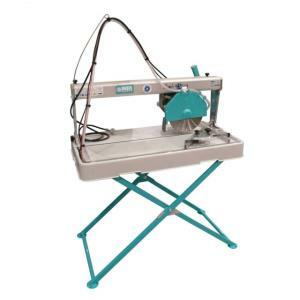 Combi 250VA is Imer's bread and butter 10" tile saw. This saw sets the standard for overhead rail saws for cutting tile and stone on the jobsite. It allows for a 31" length of cut and 3 3/4" depth of cut. Aircraft quality cast aluminum materials make for a rigid and light weight saw which will maintain its finish for years to come. This makes the saw extremely easy to clean: just spray with WD-40 and wipe clean. This allows very accurate chip free cutting, as grout joints and slab look installations are more and more common. Sealed bushings ensure plunge cuts are smooth and precise. Comes with blade and stand. The feet on the stand are rubber so the stand won't slip on or scratch the floor. * Please call us for any questions on our tub saw 10 inch rail saw rentals in Hillsdale and Ridgewood NJ.